Graduation day. 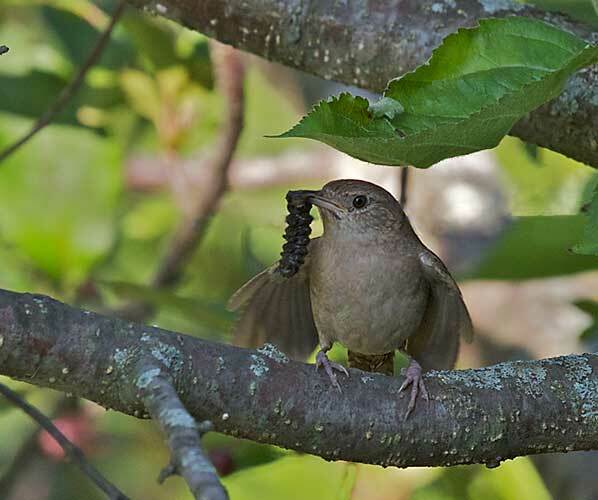 I watched the mother house wren dangle this delicious looking morsel. She stayed in the cherry tree, fluttering her wings. In the birdhouse, ten feet away, the nestling house wrens were screeching to be fed. She was right where the baby house wrens could see her. 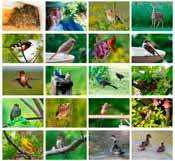 All they had to do was to leave the nest box and fly across that ten-foot space to the cherry tree. At least one baby house wren got a nice graduation present. An hour later, when I walked by the birdhouse again, it was silent. I looked inside and saw that it was empty. The wing fluttering gesture is interesting. It's how a bird begs to be fed. Baby birds use it with their parents. Adults use it with each other in courtship. But here the mother bird is obviously not begging to be fed — she's got the bug in her beak! However, she uses the body language as if to remind the babies how hungry they are. Maybe like a human mother coaxes a young child to eat by going "Yum yum."